Here, we see the five Parliamentary candidates and their fates in the 1868 election being gently satirised. 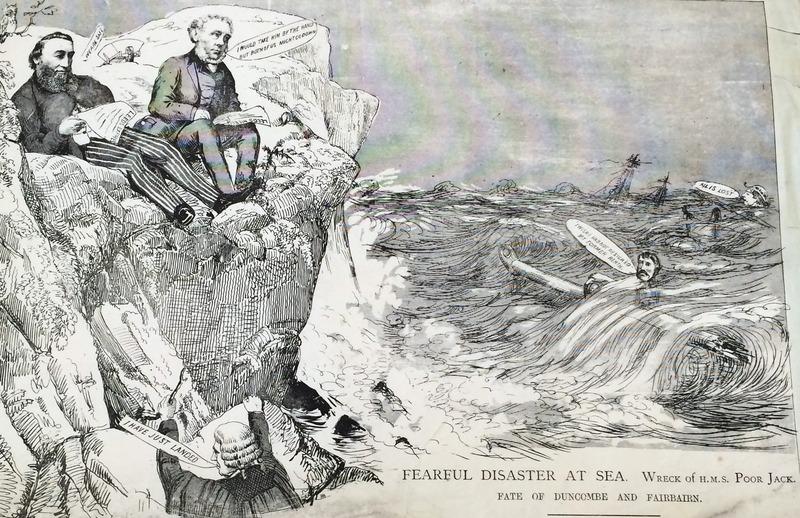 Edward Baines Jr. and Robert Meek Carter – Liberal party candidates – sat safely atop a rock in the aftermath of a shipwreck, reading the papers they were associated with, the Leeds Express and the Leeds Mercury. Carter exclaims “We are safe”, while we can also see the Tory candidate, William St. James Wheelhouse reporting “I have landed.” His fellow Conservative, Admiral Duncombe, meanwhile can be seen here on the far right adrift – “All is lost” he reports. Sir Andrew Fairbairn – standing as an independent Liberal – is saying “I wish I had not resigned my former berth” – a probable reference to his resignation from the position of Mayor. Baines can be seen commenting that he could have saved Sir Andrew – but that, in doing so, he may have lost his place in the election race alongside the doomed Knight. This image from the 1874 election shows Dr Frederick Lees, a Liberal candidate who entered the Parliamentary race alongside the two incumbent Liberal MPs, Edward Baines Jr. and Robert Meek Carter (login to the Oxford Dictionary of National Biography using your Leeds Library and Information Service account to read more about Dr Lees). The cartoon satirises Dr Lees’ desperation to gain office and the extent to which he was willing to make extravagant promises to working men in order to win their votes: one man can be seen asking “Will ye give us 8-hours pay for 4-hours work?”. 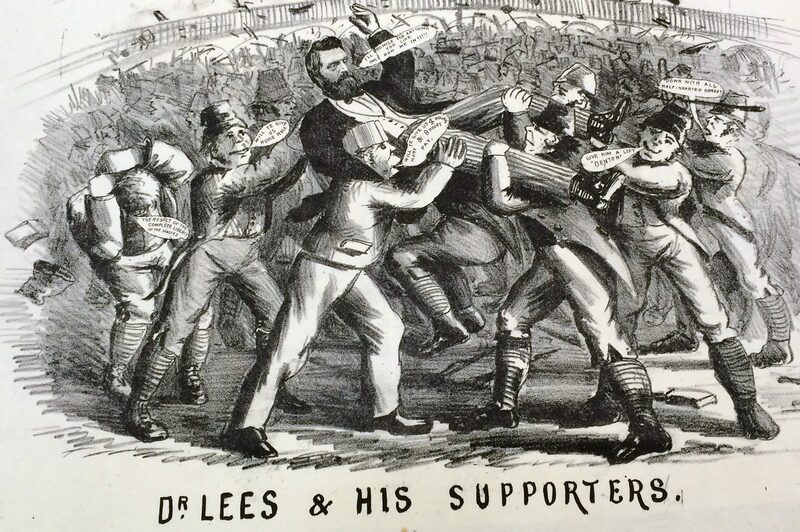 Lees’ supporters are possibly portrayed as oafish members of the Leeds Irish community: the evidence being that “ye” and the fact another man asks “Will ye give us Home Rule?”. 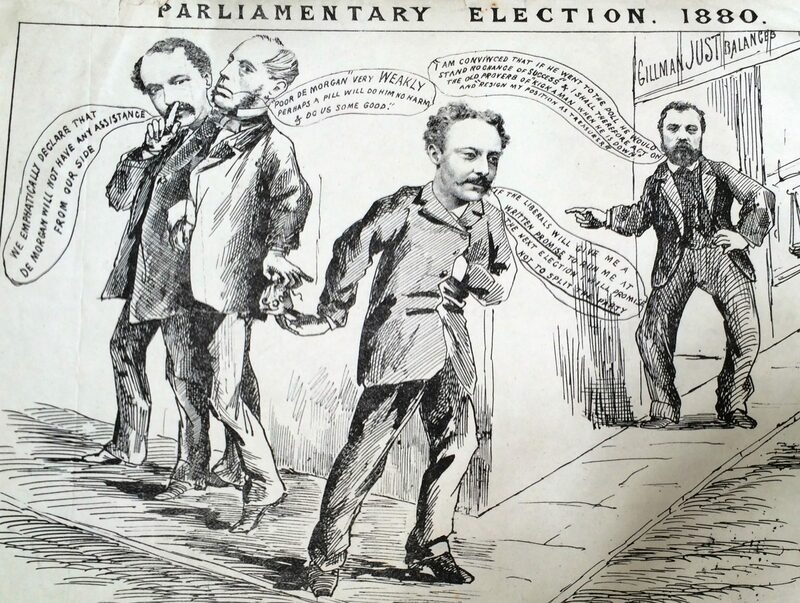 This final image – from the 1880 Parliamentary election – shows the Radical leader John De Morgan attempting to extract a promise from the local Liberal association that he will not enter that year’s race as an independent candidate so long as the party agree to make him an official candidate at the next election. However, the two Conservative candidates – William Lawies Jackson and William St. James Wheelhouse – can be seen manipulating De Morgan in his electoral intervention, while publicly claiming the opposite. All the slides from the talk – including further images from the Collection – can be seen by clicking here, while the full text can be read by clicking here. A spreadsheet constituting a rough early index to the full Political Cartoon and Prints Collection can be seen by clicking here. Further details as to the holdings and any queries as to access to the Collection can be gained by contacting the Local and Family History department in the Central Library. Previous Post Where Was Leeds Maze?